Dr. Andy Broaddus grew up in Ponca City, OK. He received his Bachelor's degree from Tulane University in 1977, and then took additional classes at Oklahoma State University before being accepted into the OSU School of Veterinary Medicine in 1981. He received his Doctor of Veterinary Medicine degree in 1985. 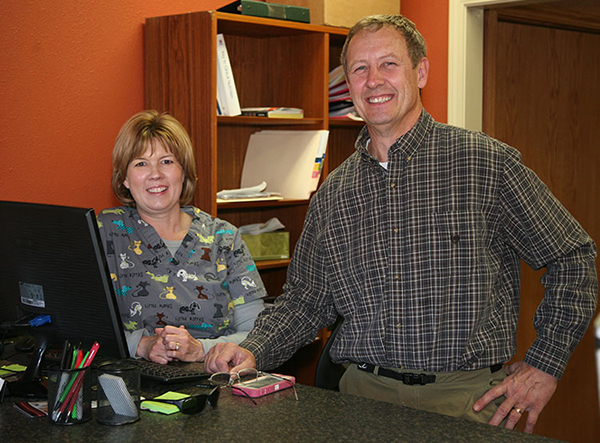 In 1991, the Broadduses, Dr. Andy and his wife Stephanie, purchased a small veterinary practice in the mountains of north Idaho. During their 22 years there, they enjoyed living in a small community and watched their practice grow and thrive. When they had an opportunity to sell the practice in 2013, they decided it would be a good time to move their family back to Oklahoma to become re-acquainted with friends and family. They were drawn back to northeastern Oklahoma as they both had spent time at Grand Lake as young adults. They have five daughters. Stephanie Broaddus attended high school in Tulsa, Ok and graduated from the University of Tulsa with a degree in Health Sciences. She then completed her Medical Technology training at St. Francis Hospital, Tulsa, and worked in the laboratory there until moving to Idaho with her husband in 1991. She managed their veterinary clinic in Idaho. Stephanie loves pets of all sorts and sizes and is excited to be able to get more "hands-on" with the patients at South Grand Lake Veterinary Clinic. She is also proud of the state-of-the-art laboratory equipment at their new clinic and is looking forward to getting to use her laboratory experience to provide quality laboratory diagnostics to the pets they serve.